Leupold VX-3 1.5-5x20mm Riflescope FREE SHIPPING! The new VX-3 1.5-5x30mm Riflescope from Leupold is an elite optic upgrade at a price point accessible to every shooter. Its top-of-the-line craftsmanship combined with a ruggedized construction make it one of the most versatile scopes on the market. An Xtended Twilight Lens System maximizes low-frequency light rays for enhanced image clarity at dusk, dawn and other lowlight situations. The scope's aircraft-grade aluminum exterior offers ruggedized protection against bangs, bumps and corrosion while O-ring seals and a nitrogen purged tube ensure waterproof functionality in any environment. DiamondCoat 2 lens coating further adds to the riflescope's versatility by protecting the lenses from scratches and cracks. Twin bias spring mounts help disperse recoil energy to ensure zero repeatability regardless of round size. 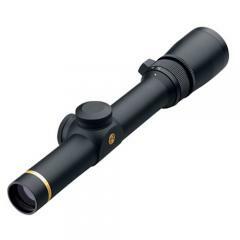 ©2002-2019 CopsPlus.com: Leupold VX-3 1.5-5x20mm Riflescope FREE SHIPPING!